He's an alpaca, but he refused to give me a better angle (just like a supermodel! ), so you can barely tell that he has a poofy topknot that characterizes this breed. 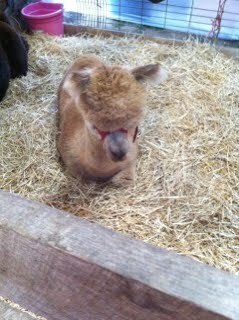 Alpacas are supposedly wretchedly bad-tempered, but he was quite placid and let a few toddlers pet him and feed him hay. I had to physically restrain Allison from climbing over the gate to take him home with her. 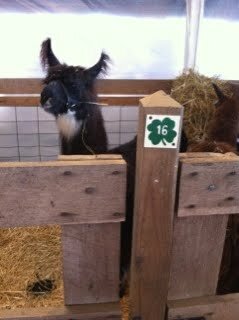 She also threatened to put in a secret bid on this guy to go home with me . . . but I told her my fierce herding dachshund would put an end to any of those shenanigans. Off we went to the main attraction for me, the sheep barns. Look at this poser! Believe it or not, these are cashmere goats, the ones that give us that luscious soft yarn for the gifts you only make for your best friend. 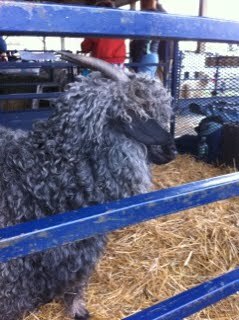 They look woolly, but we petted them to feel that springy, meltingly warm fleece, and they were so happy! The other fun thing about the NY Sheep & Wool Festival is the food — the line for Fried Artichokes was about a hundred feet long by 10:30 a.m., and by lunchtime you could have fainted from hunger long before you reached the front of the line. There were chicken pot pies made by the local 4-H club, fried pickles (yes! ), and, disconcertingly, a long list of food made from lamb. 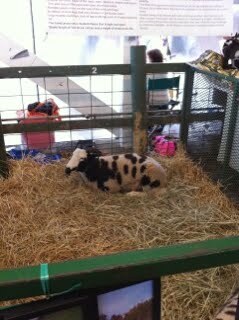 It's a little weird to watch little lambies running around a pen, then walk over to the food court to order a lamb-burger. There were cooking demonstrations; a wine tasting; lots of things to browse and buy, including square knitting needles, spinning wheels, patterns, books, and garments made from all kinds of fibers . . . and by the time we headed off to find our cars in the late afternoon, we were exhausted! I love this fair, which we all call "Rhinebeck" for short, since that is the lovely town where it's located. Will I see any of you there next year? Start planning!